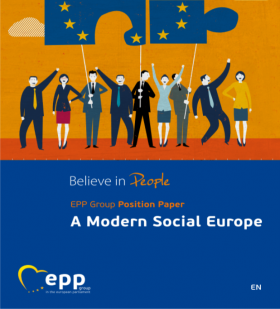 The EPP Group in the European Parliament adopted its position paper on a ‘modern social Europe’, setting out our views and priorities on employment and social policy for the years to come. EUCDW Chairman Elmar Brok and Secretary General Ivo Belet were actively involved in drafting the text, in cooperation with the EPP members of the EPP Workers’ Group. Our views on society and the economy are based on our Christian values and on the firm belief that every person is free and must be at the centre of the social market economy. The EPP Group is convinced that our social market economy is strongly linked to efficient social dialogue. The ability of social partners to participate in meaningful social dialogue is key to balancing competitiveness and fairness, thereby shaping balanced modern EU social policies that reflect the needs of employees and employers. The Group is committed to the principle that in defining and implementing its policies and activities, the European Union should always take into account social requirements. The Social Paper can be downloaded via http://www.eppgroup.eu/publications. Our views on society and the economy are based on our Christian values and on the firm belief that every person is free and must be at the centre of the social market economy.